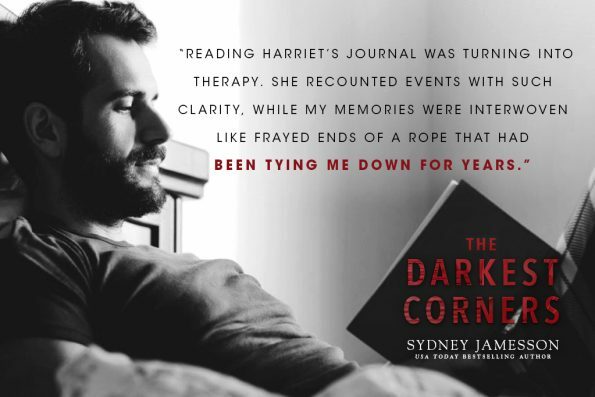 Review – The Darkest Corners By Sydney Jamesson – 5 Twisted, Whip-Lash, Epic Stars! 5 Twisted, Whip-Lash, Epic Stars! Max’s past regrets have left him living life in the dark; feeling that he’ll never see the light again. When the light begins to return, Max feels free. However, around the corner lurks dark secrets, and not all is as it seems. Sydney Jamesson has written an excellent story, full of shocking, cleverly delivered, twists, that had me reeling with a whole mixture of emotions, as each twist, and secret, was uncovered. This is the first book I’ve read from Sydney; however, it will not be my last. I love the way she writes, holding you captive in the story from the very beginning, and the emotions, she stirs from us, the reader, towards her characters. The Darkest Corners starts with great detail, the pace seems slow moving at first, however, it soon becomes clear that this story held so much depth, you needed the finer details, and each emotion, and trait, of the characters, to fully enjoy and understand the twists this story inevitably takes. And, WOW, does this story deliver a crazy, dark, twisted, heart stopping climax, questioning everything, you thought you knew about the characters. This psychological suspense story is an amazing read. If you enjoy stories with a dark edge, full of twists, and a romance element, The Darkest Corners is for you, and will not disappoint.